Pink Fish was started in 2006, when ‘Jamie met Miranda’. It may not have been love at first sight, but a strong business partnership was born! Jamie brought a wealth of experience in marquee construction, lighting and sound systems and Miranda in party catering and event management. Together they complement each other and have a shared vision for their business venture. Their customer pledge is to offer excellent events which exceed their clients’ expectations! Jamie had worked for a neighbouring Marquee Hire company and wanted Clearspan Marquees which would work hard for him. He was looking for robust, flexible equipment which would also give him a good rate of return on his investment. With excellence being pledged to his customers, Jamie expected the same from his supplier. BARKERS Marquees supplied Pink Fish Marquees with FlexiFrame Clearspan Marquees to their Aliframe design. Flexiframe: Clearspan Marquees are modular in design allowing you to add sections (or bays) to increase the length of the Marquee. 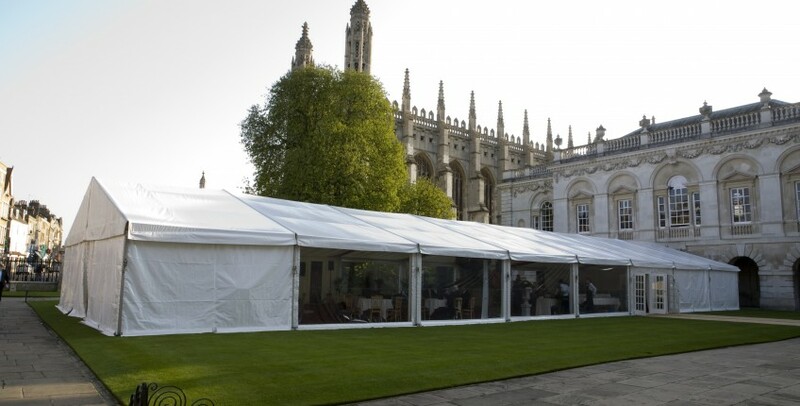 With Flexiframe, you can alter the span AND the length of the Marquee using the same framework components. By buying 3m and 1.5m Aliframe roof beams Jamie could create 3m, 6m, 9m and 12m spans straight away. He only had to invest in a variety of roof sheets and gable ends; as the rest of the equipment was the same for each span. Jamie found that his framework worked hard in other ways too. The roof beam components could double as adjustable legs, making even difficult level changes easily accommodated. So Jamie spent less on the expense element of Clearspan Marquees – the Framework – and his Framework worked harder for him! Pink Fish Marquees understand the need for reliability backed up with the ability to work as part of a team. always paying attention to every minor detail to contribute to the total success of every event. With such high pledges to their customers, Pink Fish expect the same from their supplies.